The Internet of Things is made up of different components to make things work seamlessly for its users. Software, hardware, and firmware solutions are the things that are making the Internet of Things work seamlessly together. 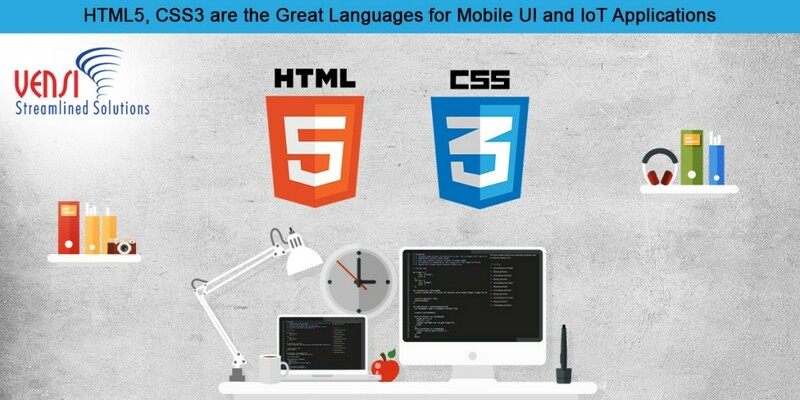 HTML5 is a markup language used for structuring and presenting content on the World Wide Web. It is the fifth and current version of the HTML standard, HTML5 is used by web developers to create web content and cross-platform applications. Semantics: allowing you to describe more precisely what your content is. Connectivity: allowing you to communicate with the server in new and innovative ways. Offline and storage: allowing web pages to store data on the client-side locally and operate offline more efficiently. Multimedia: making video and audio first-class citizens in the Open Web. 2D/3D graphics and effects: allowing a much more diverse range of presentation options. Performance and integration: providing greater speed optimization and better usage of computer hardware. Device access: allowing for the usage of various input and output devices. Styling: letting authors write more sophisticated themes. Google announced early in this month the release of its newest operating system for Android phones, this version will be a follow up to their current operating system Nougat. 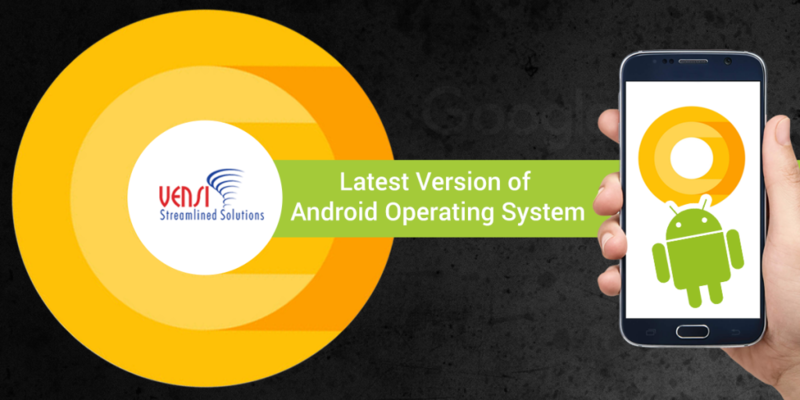 Although the new operating system is not officially named yet, there are rumors it is to be named Android O or Android One, with this new update we are expecting to see some great features to enhance the smartphone’s capabilities. Android phones are very popular with today’s user, as Android OS has the majority of the market share when it comes to smartphones. Users are expecting Android to have the best and latest hardware and software features for its smartphones. This latest updates will have very distinct updates that will change the way Android users interact with their phones and tablets, these changes will also take advantage of the new hardware that has been added to smartphones and tablets. Picture in Picture or (PIP) – Makes multitasking easier, things like taking a call while viewing a video will be made easier. Notification Channels – Enables fine tuned in-app control of notification settings, including notification visuals and grouping options which will streamline reviewing notifications. Autofill – This will minimize entering a username, passwords, and addresses. Bluetooth Audio Codecs – LDAC will increase audio fidelity. Color Gamuts – Provide a wider range of color. Copy Less – Will save users time in copying text from one app to another, Android O will automatically generate suggested text for users. 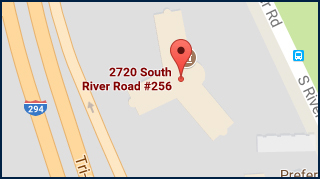 Text as an Address – With the new update addresses will be identified as a link for Google maps. Gestures – Gestures will perform certain actions on your device, based on the OEM’s features for your phone. Battery Life – Battery life was improved while using the new OS as its consumes low energy during its operations either it is running or else in saver mode. These are some of the big updates to Android O, but there are others features that are not yet confirmed. Many developers are already testing the Dev release and are excited about the new Android O features release. Android phones are now having the same if not more capabilities spread across multiple devices that range price. NFC is something that you may hear mentioned with regard to smartphones, but most of us don’t really know what it is and how to use it. NFC is easy to use and can be very useful in everyday life. 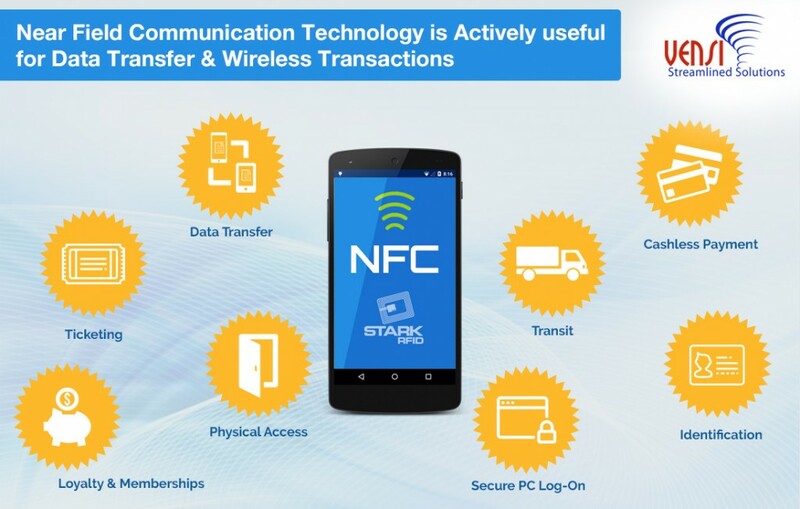 Near Field Communication, better known as NFC is a set of communication protocols that enable two electronic devices to establish communication when they are in very close proximity, about 4 centimeters. This peer to peer communication is what establishes NFC apart from other RFID devices, also having the ability to act as both a reader and a tag. This unique ability has made NFC a popular choice in contactless payments and social networking to share contacts, photos, videos, and files. Secured communication and transfer of data. Used for secure payment transactions using Smartphones. These are just a few of the advantages of NFC, today people are using NFC for contactless payment throughout the world to expedite transactions in many different scenarios, from going through a drive through to purchase a meal or coffee, to shopping for a variety of items in supermarkets, and clothing stores. NFC has really enhanced social networking with smartphones, users have the ability to share music, photo, files and contacts simply by touching the two devices. The Internet of Things and the possibilities of the connection of physical devices will be assisted by NFC, because of the secure data sharing and easy access and use. Adopters will be able to use this technology in not only residential environments but in commercial and industrial settings as well. The same reasons that makes NFC great for smartphone contactless payments and social networking are the things that make it great for the Internet of Things in all setting and industries, where there is a need for fast, secure, easy to use transfer of data with low power consumption and the ability to accurate identification of users and devices alike. Today we are seeing more and more homes using Near Field Communication to enhance their IoT solutions, and in the very near future, we will see NFC solutions for the industrial and commercial industries. Vensi has IoT solutions for various local short range communication. For More information on our IoT Solutions contact us at vensi.com/contact us. Some advantages of cross-platform development. The consistency of applications across multiple platforms. Application development cycle is reduced. Updates to apps are instantly synced without submitting changes to the app stores. The cost of development is reduced. The single version of coding can be used for multiple platforms. 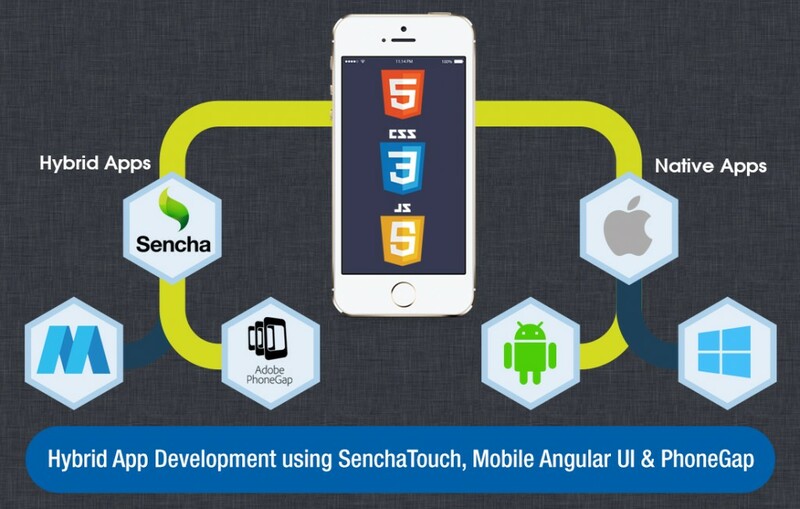 Sencha allows catering to different screen sizes for mobile and web interfaces when the application is loaded the framework determines the type of device being used. 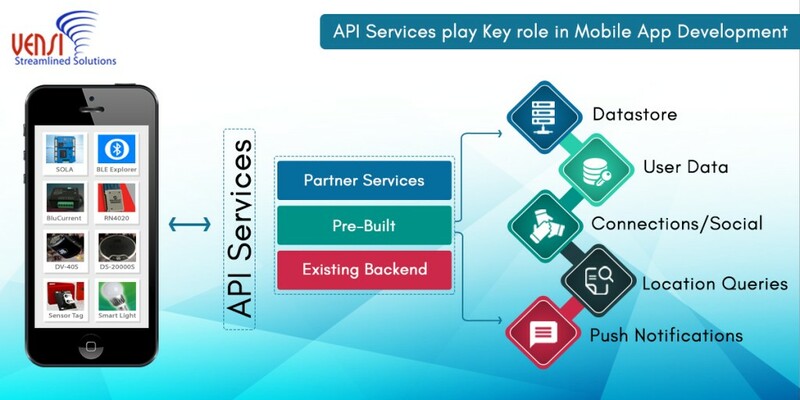 The corresponding profiles determine which components and functionality, views and controllers need to be used, which saves developers time from creating apps for different platforms. Mobile Angular UI is an HTML5 framework that uses Bootstrap 3 and Angularjs, to create interactive mobile apps. This hybrid app development code provides essential mobile components to hybrid app development, switches, overlays, sidebars, scrollable areas and top and bottom nav bars that stay fixed. This framework makes it easy to bring existing desktop frameworks to mobile applications, giving developers a responsive and touch enable the interface. This is a great framework for building mobile websites, using both Bootstrap and Angularjs. Vensi Inc, we are a team of experts who are specialized in the development of hybrid app development using various cross platform sources like PhoneGap, Sencha Touch etc. Vensi software development team uses these frameworks and developed hybrid applications for its partners and provided the best solution for the desired project. 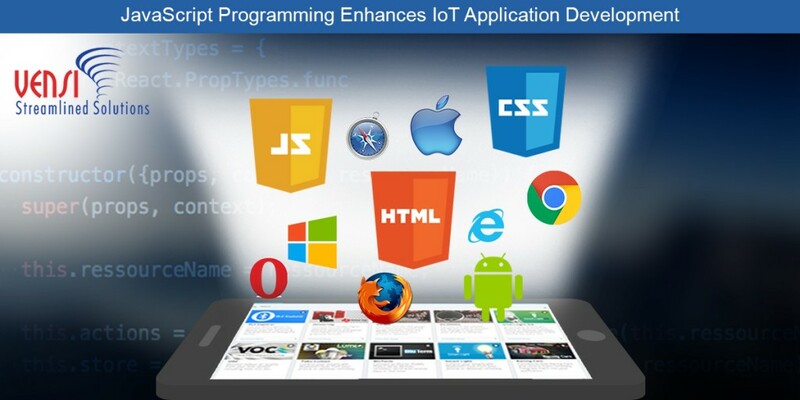 We are also experts in developing IoT applications. In the past, we have written blogs about the growing number of mobile users that rarely use desktops to access the web. This past Friday on November 25th, 2016 an astonishing number was reached with mobile app purchases, US shoppers purchased $1.2 billion dollars through mobile transactions on Black Friday, the biggest shopping day of the year. That is not the only milestone that was reached on Thanksgiving, but Online shopping increased 21 percent to $3.34 billion in sales surpassing last year’s number in online sales, which was $3 billion in online sales. In the US by the end of Black Friday shoppers spent $5.27 billion. Bank Rate reported only 23 percent of US consumers said they planned to shop in stores after Thanksgiving this year, compared with 28 percent last year. By the way, Adobe said the five top-selling electronic products on Black Friday were Apple’s iPads, Samsung’s 4K TVs, the Apple MacBook Air, LG’s TVs and Microsoft’s Xbox. The shifts in Mobile trends are reshaping the retail industry right before our eyes, what other industries will mobile have this big and effect on. 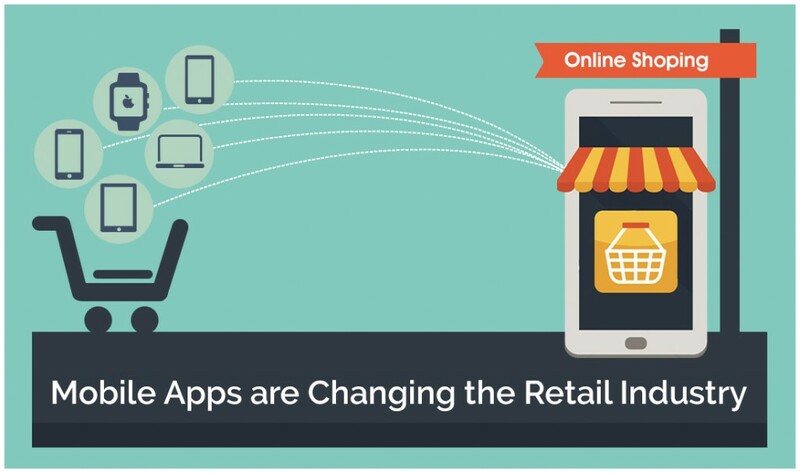 For consumers, mobile apps are a great way to improve their shopping experience. Shopping with mobile apps has many benefits rather than going about shopping the traditional way at the mall, which has it’s many challenges. Mobile shoppers are empowered with multiple stores and brand option in real-time. Price comparisons are done easily through mobile apps of various brand and similar products. Detailed product information is available at the push of a button. Helpful user reviews to judge the quality of a product. Checkout processes are much faster than standing in line. The retail industry has been focused on improving customer satisfaction through mobile apps, and with good reason. The revenue driving through mobile apps this past Black Friday is amazing and will continue to grow as retailers focus on new opportunities for engagement for consumers that previous technology could not deliver. Retailers are taking advantage of mobile apps and new technology to increase sales by building personal relationships with individual customers based on their shopping styles and the user’s mobile activities; which are monitored and tracked for so that the next purchase is tailored for them. The retailer industry is now running loyalty programs, new customer offers, and promoting new products all with mobile apps this is opening up another source of revenue for retailers. Mobile Inventory Maintenance – Personally when I’m in a store and need assistance, more and more lately sales associates are able to search in-store and locate the item, this feature is very helpful when shopping. The point of Sales (POS) Mobility – I’ve been in stores and have been able to avoid long checkout lines, because of mobile POS systems. Location Based Service – Although they encourage you to spend money, these location-based services provide great sales on items you’ve search. Customer Loyalty apps – Discounts and reward programs are a great way to keep people coming back if they are actually being rewarded for their loyalty, the retail industry is doing that with something people always have on hand, their smartphones. Omni-channel Experience – This is a great way to increase a brand’s visibility in different markets, by making the product available in multiple selling channels. Product Info: Retailers are providing consumers, info on different products when they are available with them based on their past search in online by sending notifications to their mobile apps to maintain regular interaction with the consumer. Vensi Inc, we are specialized in developing Mobile Apps for retail and commercial use. We developed service and utility mobile apps useful for many mobile users on different Mobile platforms & web. Mobile Apps are playing a key role in the enhancement of retail business to reach more people in future for better and easiest shopping experience with a click. Since 2006 there has been a huge increase in mobile application developers, today in 2016 there is an estimated 12 million app developers across the world. This demand is because a lot more companies are adopting a “Mobile-First Strategy” instead of desktop first. Before the mobile first strategy became the new business strategy, most web designers and their client’s approach to software development, was to implement the desktop version of a project first and then to create mobile applications later. The approach now has been mobile first and then desktop, some think that this may be a trend, but if you look at some of the data that is available on the web you’ll see that this is a present day reality. Let’s take for example the number of mobile web users worldwide, there is an astounding 1.2 billion mobile web users, 25 percent of those user, rarely use desktops to access the web. The other statistics is that over 10.9 billion mobile apps have been downloaded; these numbers are staggering considering there is an estimated 7.4 billion people on planet earth. Companies are realizing that by designing mobile applications first, rather than desktop first. You don’t have to deal with the complex issues of scaling back from a desktop design. When designing with a desktop first strategy, you put everything you have into that desktop design, technology and use up all of real estate, only to realize that trying to put all of this information on a mobile app, makes for a watered down version on the mobile side, because you have to remove a lot of the pertinent information to make it scale to a mobile app version. With mobile design as the first priority, you get to decide how you can make your project more robust, and can build upon content and features. If you load up all of the content and features like text, audio, video, etc., which is normally done in a desktop development. Then you face the issues of having more content than it is actually needed for the mobile version, if all of that is to work on a mobile app it will negatively affect the operation of the app. This will turn users off and they will look for another similar mobile application. The mobile first approach might put a little more work into the initial creation of the project’s scope, as everyone will want to focus on the absolute necessities for the project to avoid an unnecessary functionality performance lags on the mobile devices. Once the app is released then you’ll be able to add additional content and functionality based on the devices ability to handle them. The mobile first approach uses responsive design, which for a non developer sounds great; it addresses all of the platforms in one development cycle. The downfall of responsive design is in its complexity. There are not many mobile application developers that have the capability to work with the many different languages to code it properly to fit to android, iOS and desktop screen sizes. Some developers are limited to developing on desktop because they have to really consider all of the possibilities with the lack of real estate and that alone limits their creativity. Developers are forced to look at the canvas in a much smaller view, and then add the most important things in the mobile view to make it as important or usable to desktop. If you’re considering mobile application development and know that you need a responsive design professional, make sure to do your research before you start your project this can be the difference of going over budget, taking more time to complete the project or just scrapping the project all together. 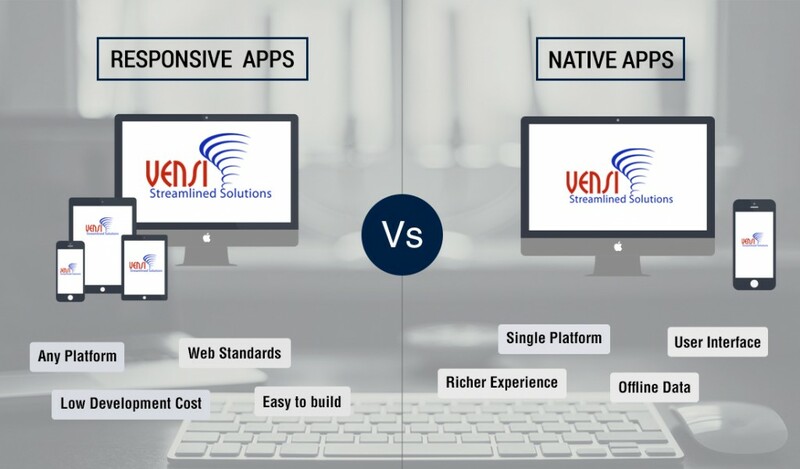 Vensi Solutions specializes in responsive Mobile app development using HTML5, CSS3 & AngularJS with W3 Web Standards. We are expertise in developing cross platform mobile applications for web & mobile. Google has just released its updated Gmail and Calendar app for iOS to the Apple store. This is a big update for IOS users, because of the huge number of people that use Gmail for personal and professional use. This gives Google access to a group of users that would otherwise be out of reach. 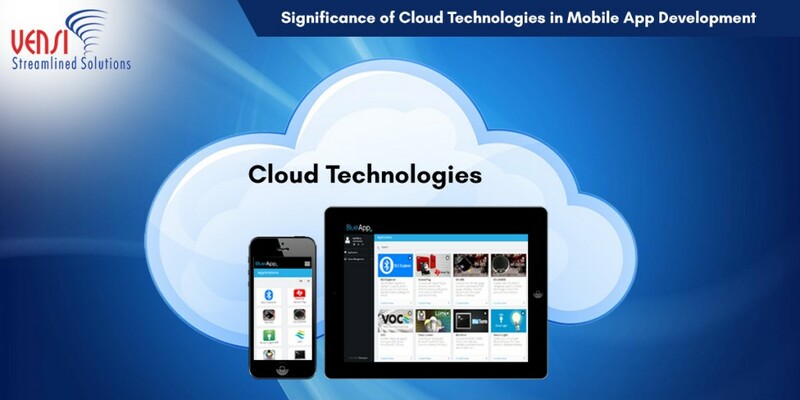 These two applications are a big part of their cloud based services, and will attract iOS users to the platform. Gmail for sending and receiving emails. Google Drive to share and store files, documents and video. Google Chat for internal communication with colleagues or for personal use. Google Hangout for virtual meetings, which allows users to visually sharing documents like a WebEx or Gotomeeting. Google Voice for making phone calls, which can be synced to your cell phone. 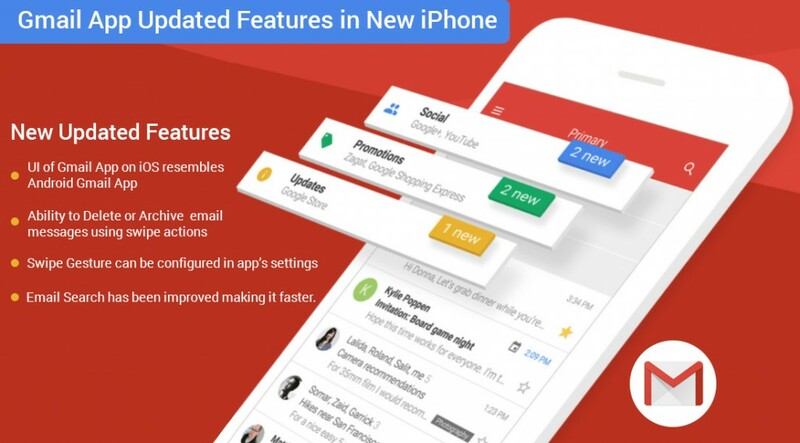 With improved updates for iOS, Google will add more iOS users to the Gmail platform, but with iOS lacking in some of the Android features. Below are some of the features that will bring iOS up to date with Android. Revamped user interface with sleek transitioning. iOS to resemble in design Android devices. Swipe actions to delete and archive emails, which are configured in iOS settings. Email search capabilities have been improved to make them faster and more efficient. Undo send to revert sent emails. Google is also working on a new responsive design for its Android and Web versions, this will adapt to the different screen sizes of the different devices to automatically fit all screens. Responsive design is an app development concept that a lot of app developers are using to create a seamless user interface with mobile and web applications for personal and business use. These Responsive design applications are becoming more and more attractive to mobile app developers as it makes it easier to develop multiple applications in one development cycle. While giving the same look and feel for the UI across multiple platforms.